Kheersagar: Kheersagar is an Oriya sweet dish that literally translates to Oceans of Milk in the Oriya language. 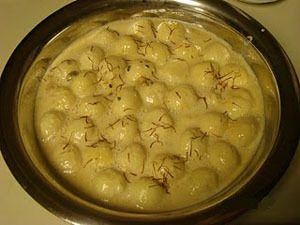 Kheersagar consists of marble-sized balls of chhena cheese soaked in sweetened, condensed milk. Saffron and cardamoms are the typical seasonings that are added to this dish. Kheersagar is very similar to another Oriya favourite and the more well known, Rasmalai. The difference is that the milk base used in kheersagar is thicker and has more of the same consistency as Rabri. The sweet has depiction in the Hindu mythological scripture about Lakshmi serving Vishnu and Madhusudana with it. Boil the milk on medium heat in a heavy bottomed pam. Add in the lemon juice and stir mixture continuously till it becomes curdled. Drain the curdled milk through a muslin cloth. Wash the chenna under running water, to remove the lemony taste. Squeeze out all the excel water out of the chenna. Transfer the chenna in a bowl. Add in 2 tablespoon all-purpose flour. Make 10-15 small round balls with your palms. Heat the milk in a pan on medium heat. Add in the sugar and half of the saffron threads. Cook the milk, stirring continuously, till the milk is reduced to half of the original volume. Add in the cheena balls to the above ras. Cook for 10-15 minutes with partially covered lid. Cheena dumplings will swell and puff up and ras will reach the desired consistency. Cool the kheersagar to room temperature. Add in the good quality rose water and decorate it with remaining saffron threads.